Bacteria that can live and multiply in High Arctic permafrost at temperatures well below the freezing point of water have been discovered by a Canadian-led team of researchers, offering clues about the types of organisms that might exist in similar extreme environments elsewhere in our solar system. The OR1 strain of the microbe Planococcus halocryophilus is capable of reproducing at –15 C — a record among all known living organisms — and may possibly be able to multiply at temperatures even colder than that, says a study published Wednesday in the ISME Journal. The bacteria remain active at temperatures as low as –25 C.
"You look at permafrost, you think of this frozen dead world, but it's not," said Lyle Whyte, a McGill University microbiologist who co-led the study with post-doctoral researcher Nadia Mykytczuk. "The study that we show here indicates there are organisms that are … capable of surviving and reproducing in the conditions in which it came from, the permafrost." The bacteria were among 200 or 300 strains collected in 2004 from a permafrost core drilled by NASA on Ellesmere Island, Nunavut, as part of a project to develop robotic drilling techniques for use on Mars. The permafrost has been frozen for 5,000 to 6,000 years and the environment has an average temperature of about –16 C.
Whyte's team was asked to help NASA ensure the samples were not contaminated. Once the drilling was done, NASA had no further use for them and handed them over to Whyte, whose research group specializes in hunting for bacteria that can survive in extremely cold environments. The bacteria shown in this electron microscope image can reproduce while living at –15 C in an environment that is many times saltier than seawater. (McGill University)"For me, this stuff was gold," Whyte told CBCNews.ca in an interview, noting that drilling permafrost is very difficult to do. Researchers in his lab spent years screening the many microbes in the samples and learning how to grow them at very cold temperatures — a challenge because the researchers have to keep the liquid environment they live in from freezing. Once they succeeded, they found that the bacteria doubled in population about every 40 days at –15 C in a medium that contained 18 per cent salt, partly to keep it liquid. For comparison, seawater contains about 3.5 per cent salt. Whyte, who holds a Canada Research Chair in environmental microbiology, estimates that the microbes would probably reproduce 100 to 1,000 times more slowly in their natural environment. In the permafrost itself, the bacteria live in little veins of brine, he added. These tiny channels of extremely salty water form when water freezes and in the process expels impurities such as salt. Whyte's team analyzed the genes of the bacteria and discovered that many of their enzymes and other proteins are highly adapted to working at cold temperatures. 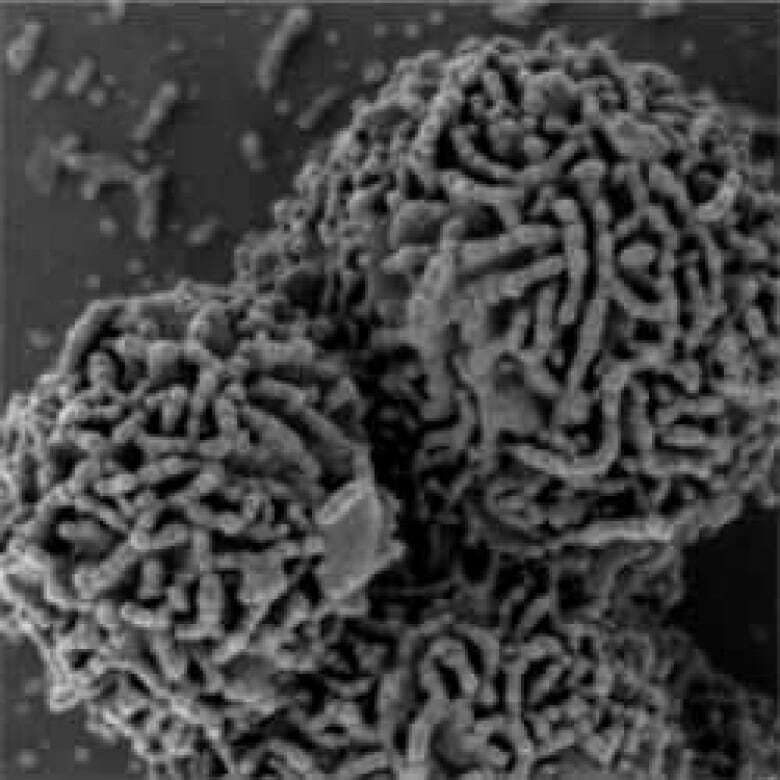 In addition, they are genetically programmed to produce high concentrations of osmolytes — small molecules that help retain water inside the cell so it can survive in very salty environments without getting the water sucked out of it via osmosis. The osmolytes also act as an antifreeze. The team is interested in studying bacteria like these in order to understand how microbes live at subzero temperatures, Whyte said, and to use that knowledge to hunt for microbial life on places like Mars, Jupiter's moon Europa or Saturn's moon Enceladus. "On Mars, we know there are permafrost environments, and we're pretty sure now that there are very cold salty environments as well," Whyte said, "which make them ideal targets for looking for similar types of life." Europa and Enceladus are also thought to have cold salty water below their icy surfaces. Whyte and his team are currently hunting for bacteria like P. halocryophilus that can survive in very cold environments, but unlike P. halocryophilus, don't need to breathe oxygen or eat organic carbon. Closer to home, scientists are interested in learning more about how bacteria in permafrost might affect the release of greenhouse gases as the Arctic climate warms and the permafrost melts, Whyte said. The bacteria are also a potential source of biotechnology, such as cold-active enzymes that could have applications in products such as laundry detergents. The study was funded by the Natural Sciences and Engineering Research Council of Canada CREATE Canadian Astrobiology Training Program, the Canadian Space Agency, the Polar Continental Shelf Program, Canada Research Chairs Program, and the Canada Foundation for Innovation. An earlier version of this story incorrectly identified one of the people in the photo as a student. In fact, the person in the photo is postdoctoral researcher Nadia Mykytczuk.